Overview: Precision Camshafts is a small auto ancillary firm that makes camshafts. Revenues, EBITDA and PAT have grown by 22.3%, 44.1% and 45.3% CAGR over 3 years. Key strengths are good camshafts expertise, global customer base and 78% exports revenues. Current equity market conditions are positive. The small size of IPO should work in its favour. Some of the negatives include excessive promoter compensation and aggressive IPO price range / high valuations that leave little on the table for value investors. Overall Opinion: Investors can subscribe to this IPO for a 2 year perspective. 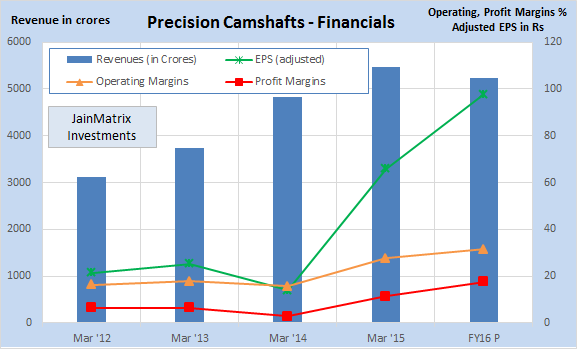 Here is a note on Precision Camshafts Limited (PCAM). There are 2.2 crore shares of Face Value: Rs. 10 each on offer to raise Rs. 397 – 410 cr. Purchases may be made in minimum lot size of 80 shares and multiples of 80 thereof. Rs 170 cr. (upper end) – earned by promoter/ investors who reduce stake from 82% to 64%. Rest of the funds – will be used for general corporate purposes. The valuations of PCAM are 27-28 times FY15 and 18-19 times projected FY16 financials. Precision Camshafts (PCAM) started in 1992, has HQ in Solapur Maharashtra and is an auto ancillary firm engaged in making camshaft for a range of automobiles. PCAM had revenues and profits of Rs 547 cr. and Rs 62 cr. respectively in FY15. PCAM has a global market share in passenger vehicle (PV) camshafts of 8-9% in 2014. Over 10 years, PCAM has supplied 58 million camshafts to customers in USA, Brazil, UK, Germany, Australia, Hungary, Russia, South Korea, Spain, Uzbekistan, China and India. PCAM has 1,624 employees, and the manufacturing units are in Solapur, Mah. and in Huzhou, China (under JV with Shenglong Automotive Power Train Co Ltd). PCAM supplies over 150 varieties of camshafts for PVs, tractors, light commercial vehicles and locomotive engine applications. The camshaft is one of the five critical components of the automobile engine along with the cylinder block, crankshaft, cylinder head and connecting rod. PCAM has a total mfg. capacity as on Sept 30, 2015 of 1.34 cr. camshaft castings from the foundries per annum and 0.22 cr. machined camshafts from the machine shops. The current utilization of these capacities is 75.5% for foundries and 55.1% for machine shops, which places PCAM in a comfortable position in terms of immediate capacity. PCAM won awards for ‘Best Overall Exporter’ and ‘Best Manufacturer Exporter’ from D&B India at the ECGC Indian Exporters’ Excellence Awards among medium exporters in Mar ‘15. PCAM has increased exports, Fig 1. In FY15, the exports /domestic revenue were Rs. 403 /111 cr. resp. At Solapur there is a EOU unit that has 4 foundries and 2 machine shops and a domestic unit. From only mfg. of chilled cast iron camshafts, PCAM has expanded its mfg. to produce ductile and assembled camshafts. It also proposes to set up two new machine shops at Solapur, Mah. for ductile iron camshafts and assembled camshafts by FY17-18. They will also enter into mfg of sliding cams and cam modules as per their expansion strategy. In 1999, PCAM entered into a technical and financial JV with G. Clancey Ltd, UK,. In 2006, PCAM acquired the JV by acquiring the stake of its partner. The firm is now called Precision Valvetrain Ltd. In 2011, they incorporated a wholly owned subsidiary ‘PCAM (Shanghai) Co. Ltd in China. In 2012, signed a JV with Shenglong Auto. Powertrain China for a camshaft machining facility. In 2013, signed a JV with Shenglong Auto. Powertrain China and ZMM Technology Ltd, to set up a Foundry for manufacturing 40 lakh camshaft castings per annum at Huzhou in China. In 2014, an exclusive agreement was signed with EMAG, a German machining – tooling firm, for transfer of certain know-how and technology for manufacturing of assembled camshafts. Their camshafts use a force free heat shrink technology which has been patented by EMAG. Indian auto ancillary industry is a growing fast, riding on the success of the automotive sector. Indian auto component industry clocked a turnover of Rs 2.34 lakh cr. ($38.5 billion) in FY15. Auto components may become the 3rd largest globally by 2016 with 5% of global sales. The autocomp sector recorded a CAGR of 7.8% during the period of 2008-14. In FY15, auto component sales grew 11%, compared with 3% in FY13 and FY14, showing a recovery. Manufacturing expertise, low labour costs, availability of skilled labour and high quality consciousness among Indian vendors are the key strengths. India is also developing as a global mfg. hub for two wheelers and small cars, with robust domestic demand and global export opportunities. Many auto MNCs are setting up here. Outlook: Cooling inflation, growth in urban disposable incomes, and lower interest rates would boost car & bike sales. With an economic recovery, demand for CVs will increase. Auto sector sales are likely to bounce back strongly in the next 2 years, because of improved investment cycles, disposable income and consumer sentiments. According to the ICRA Research, the global PV camshaft volume is estimated to be 10 cr. for 2014 with an estimated market value of Rs 7,000 cr. and is expected to grow at 4% to 5% over medium term. The PV production is estimated to grow at a CAGR of 9-10% by fiscal 2020. Camshaft technology trends: There are increasing govt. regulations to reduce vehicle emission and improve fuel economy. So firms are focusing on altering the structure of camshafts to integrate them with cylinder heads. Assembled camshaft is one such tech where the camshaft is integrated with the cylinder head using hydroforming. This reduces the weight by 60%, reduces rotational inertia, lowers noise and vibration; improves fuel economy, engine dynamics and performance. Revenues, EBITDA and PAT of PCAM have grown by 22.3, 44.1 and 45.3% CAGR over 3 years. The total debt is Rs 217 cr. The D/E ratio is 0.81 which is moderate (as on 30/09/15, pre IPO). Additionally, reserves are Rs 187 cr. which is healthy. The margins have increased in the last 3 years. OPM has increased from 16.2% to 27.7% and profit margins from 6.5% to 11.4% since 2012. Also in H1 FY16 there appears to be an improvement. The promoter stake will reduce from current 82% to 64% post IPO. See Fig 3. 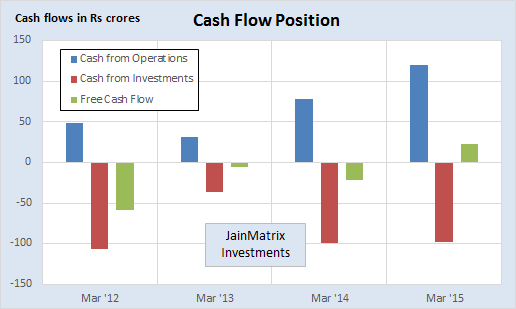 PCAM operations have had positive Free Cash Flows only in one of the last 4 years. See Fig 4. However we see this positively as this is due to investments in the business. In a benchmarking exercise, we compare PCAM to some listed peers. See Fig 5. PCAM has leadership across the peer group on Margins. It is also #2 for Sales & Profit growth. Also on ROCE, it is among the leaders. These are impressive ratios. On Debt to Equity ratio, PCAM falls in the average for this group. This is OK. The asking valuations appear stretched as at upper end, P/E is 28.3 times FY15 EPS. This is close to MSS valuations – a highly reputed global firm. Thus while PCAM is a small company in this group, it has so far enjoyed good performance ratios. The firm is issuing fresh shares for this IPO, which will raise equity and premium funds. These will strengthen the balance sheet and can be used for funding the growth plans of PCAM. With an 8-9% global market share in PVs, and less in other auto categories, there appears to be ample room to grow for PCAM for the next 5-7 years, at current growth rates. With 78% of revenues from exports, PCAM will continue to benefit from INR/USD weakening. It has long term relationships and, in some cases, preferred supplier status, with marquee global OEMs in the auto sector, like GM, Ford Motors, Hyundai, Maruti Suzuki and Tata Motors. PCAM have diversified and expanded mfg. capabilities from chilled cast iron camshafts to ductile iron camshafts and assembled camshafts, and also supply of cam modules and sliding cams. The increase in mfg. and supply of value added products will enhance margins. Thus they are building leadership within the camshaft category. See product range Fig 6. PCAM performance and growth indicate a business that is linked to global auto sector. Good manufacturing facilities, technology innovation and engineering expertise. The leadership team of PCAM is an experienced and diverse team of professionals. Increasing geographical penetration and expansion of addressable market. Plans are for inorganic growth which may see growth accelerate in future. The PCAM IPO seems to be well timed. There have been a spate of successful IPOs in India in recent months. Some good IPOs have been heavily oversubscribed. PCAM has to adhere to strict quality requirements and any failure to comply with these can lead to cancellation of existing and future orders. The 3 top executives of PCAM received Rs 32.4 cr. in FY15 through salary, commissions and benefits. (as per RHP). When compared with Net Profits of Rs 62.4 cr. for PCAM, this appears excessive and out of line with industry standards. Additionally, there are annual increments in their contracts. This will certainly be an interesting topic in post IPO AGM meetings. It appears that PCAM’s customer’s contracts do not include committed purchase volumes and timelines. Hence PCAM has to react to customer requests in short time frames, exposing it to delivery challenges and risks. Or may have to keep high inventory, at higher cost. Volatility in the supply and pricing of raw materials can have an adverse effect on business. However the current fall in prices of metals may be beneficial to PCAM. PCAM is exposed to foreign currency exchange rate fluctuations, which may harm their financials. However, the weakening INR/USD indicates an upside risk to revenues. The IPO valuations of a PE of 27-28 times FY15 and 18-19 times projected FY16 appear to be high in the context of a small cap firm. As much as 57.3% of PCAM revenues come from just 2 clients, GM and Ford (source: RHP). This poses a client concentration risk on PCAM business. PCAM caters to global markets and business can be affected by poor global economic conditions. Global auto component players have started operations in India which can pose strong competition. In camshafts, the replacement market is small, so PCAM has to concentrate on OEM business. PCAM has restricted its business to camshafts. While today they can grow within this sector, in the next 5-7 years, they may need to look at other components to expand business. PCAM is a micro to small cap company, and so faces related risks like riskier operations (mfg. is in only one location), high dependency on a few senior executives and on a few customers. The firm may need to plan for derisking business even as it grows fast. Indian auto ancillary mfg. is a high potential space with ample domestic demand and global opportunities. India has many competitive & comparative advantages in this sector. PCAM appears to be a focused company with a strong niche, mfg. strengths and good potential. The business is export oriented by nature. Current equity market conditions are positive. Being a smaller IPO may also work in its favour. The negatives include excessive promotor compensation. We also feel that the asking valuations are aggressive and leave little on the table for value investors. However putting all this together, we feel that PCAM, like its products, has an Attractive Finish. Investors can go ahead and BUY this PCAM IPO with a 2 year perspective. Here is a note on the PCAM IPO in PDF format.